Former executive director Joseph J. Kearney stepped down Jan. 3 to take a job with the county Board of Elections. The Nassau County Industrial Development Agency is now accepting applications for executive director, a job that records show paid $191,000 in 2017. Former executive director Joseph J. Kearney stepped down on Jan. 3 after more than eight years on the job. He now works for the county Board of Elections. Richard Kessel, chairman of the IDA board of directors, said applicants should contact him “soon” because he and the other directors hope to fill the position by March 31. Kessel outlined the job search last week after Nassau County Executive Laura Curran surprised Kearney with a citation recognizing his service, which started in June 2010 under then-County Executive Edward Mangano. Kearney, 76, a former Republican Hempstead Town councilman, had campaigned for Democrat Curran’s rival in the 2017 county executive race, former State Sen. Jack Martins (R-Old Westbury). Kearney was recently appointed deputy Republican Board of Elections commissioner by Nassau Republican Committee leader Joseph G. Cairo Jr. The elections post pays $160,000 per year, according the county comptroller’s office. In Nassau, the election of a new county executive usually means changes at the IDA. 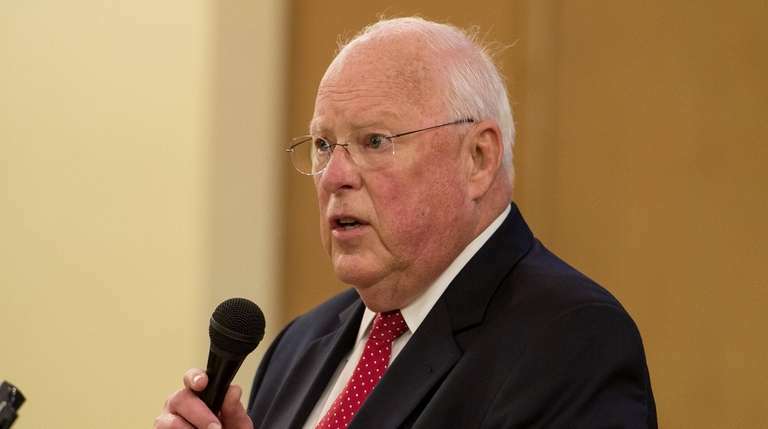 However, Kearney remained IDA executive director for an additional year under a deal between the county's major political parties, said two sources who requested anonymity because they weren't authorized to speak publicly about the deal. Kearney, responding to Curran’s praise, said last week that the IDA has “tried to do what’s absolutely right for the county and the taxpayers” by fostering “the growth and prosperity of the county.” He said small businesses damaged by superstorm Sandy in 2012 were able to reopen in part because of a sales-tax exemption granted by the IDA in 2012-13.